The GX3232 is a multi-channel 16-bit, analog input and output cPCI module, supporting 32 single-ended or 16 differential input channels and four analog output channels. The inputs can be software configured for differential or single-end operation and are sequentially scanned with a maximum aggregate scan rate of 300 kS/s. Three input ranges are software-selectable: ±10 V, ±5 V or ±2.5 V. Optionally, the GX3232 is available with a high voltage input configuration and supports three ranges: ±60 V, ±30 V and ±15 V. The high voltage configuration supports 16 single-ended or 8 differential input channels. Four analog output channels provide software-selectable output ranges of ±2.5 V, ±5 V or ±10 V. The outputs can be updated either synchronously or asynchronously and support waveform generation. Each output can be clocked at rates up to 300 kS/s. 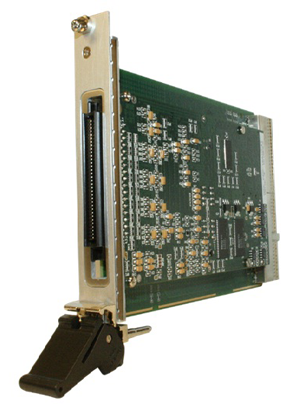 A 16-bit digital I/O port is also provided, which supports 16 bidirectional data lines. Note that when used with a TS-700 system only 8 of these digital I/O lines are available at the test system's receiver interface. The GX3232 is supplied with a virtual instrument panel, which includes a 32-bit DLL driver library and documentation. The virtual panel can be used to interactively adjust and control the instrument from a window that displays the instrument’s current settings and measurements.